As the Indian hospitality market booms, smart hotel operators are looking to food waste as an opportunity to cut costs. To drive real results quickly, however, the sector should pay attention to the food wasted before it gets to the consumer rather than the food left on diner’s plates. The Indian hospitality market has shown strong growth over the last two decades and is one of the most exciting globally. The market consisted of just 18,000 branded/organised rooms in 1995, but in 2016 there were more than 113,000. To put India’s market size in context, though, Bangkok alone has more than 125,000 rooms. There is therefore still enormous growth potential in India as tourist numbers rise and the middle class expands. Analysts at KPMG forecast 16% annual growth in the sector between now and 2022. As the hotel market grows, the F&B sector grows too as operators create new restaurants and dining experiences for guests and local customers. This happens across the world, but in India the effect is particularly impressive. In Europe and the US, for example, a hotel often generates 25% of its total revenue from F&B, compared with the 65% it might generate from its rooms. In India, however, F&B contributes a much greater share of a hotel’s revenue, and this share is growing quickly. According to a recent HVS-FHRAI report, F&B revenue in Indian hotels rose from 37% of total revenue in 2010-11 to 43% in 2014-15. Room revenues declined from 57% to 51% of the total over the same period. Dipak Haksar, chief executive of ITC Hotels and WelcomHotels, says: “There has been a marked, double digit growth in food and beverage revenues over the past couple of years. Within the F&B segment, banqueting is showing great potential, which is powered mainly by MICE [meetings, incentives, conferences and exhibitions] and this has positively impacted our F&B revenues, boosting overall revenues at ITC Hotels." As the F&B sector grows in size and importance, so does the issue of food waste. It is high on the national agenda - 40% of all food is wasted in India, costing the economy Rs 50,000 crore. The amount wasted could feed the state of Bihar for an entire year. Prime Minister Narendra Modi labelled food wastage as an “injustice to the poor” on his radio show when he introduced plans to regulate the portion sizes served in hotels. “If a person can eat only two prawns, why should he or she be served six? If a person eats two idlis, why serve four! It’s wastage of food and also money people pay for something that they don’t eat,” said Ram Vilas Paswan, Minister of Consumer Affairs, Food and Public Distribution. Much of this conversation rests on post-consumer waste, the food left on customers’ plates, but Winnow’s data shows that there is actually a huge opportunity for hotels and caterers in reducing pre-consumer waste. We are contracted to over 1,000 hotels, staff restaurants, universities, schools and hospitals. The data we have gathered shows that, in kitchens where food is prepared in advance, two thirds of avoidable food waste happens before it gets to the customer. In almost all cases this is because more food is prepared than necessary. Food waste is an age-old problem for all chefs. 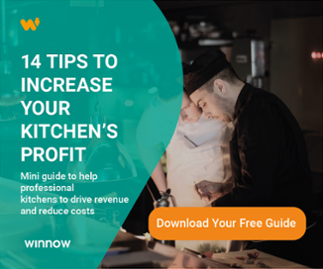 It consumes 5–15% of a kitchen’s total food spend, but it is notoriously difficult to measure. When they use digital tools to track wastage and pinpoint improvement areas, teams typically see food waste cut in half. This reduces total food costs by 3–8%. Hotels should be excited about food waste in 2018. As the sector continues to grow at pace, smart operators who begin to see food waste as an opportunity will thrive. Where else in our sector do we have the chance to dramatically cut costs while doing the right thing at the same time?